Last week on the TMS e-mail thread, I made a comment that caused my fellow bartenders to call into question my intelligence, my sanity, and even my sexuality. I tossed off the opinion that were I the Cubs' new owner, I would build a new ballpark. Judging by the reception I received for that suggestion, I can only surmise that I can expect a similar outpouring of vitriol from the folks who read this website. No matter, I will press ahead with this post regardless. First of all, before you get out the tar and feathers, please understand that I love Wrigley Field as much as any other Cubs fan. I think its a beautiful old ballpark with a ton of history. She's a grand old lady, a ghost from baseball's past, whose brick and ivy clad walls have seen the passage of time and the making of history. They've borne witness to some of the great players of the ages and seen baseball's color barrier fall. With the Yankees moving into their new ballpark this season, only Fenway and Wrigley stand as icons of baseball's Golden Age. So why move? Well, for starters, Lady Wrigley is falling apart, having been ravished by the forces of time. Netting cannot hold back this erosion forever. A multi-million dollar rennovation has been proposed, but I think the Cubs organization would be better served to spend that money on constructing a brand new, state of the art facillity. As the years go by, Wrigley is only going to continue to require more and more upkeep to maintain it safely. Let's not forget, the building is ninety-five years old. Secondly, there may be tradition at Wrigley, but there is no winning tradition at Wrigley. The Cubs have never won a World Series at the Friendly Confines. I don't believe in curses or any of that nonsense, but Wrigley has certainly seen her fair share of futility over the years. Thirdly, I think that modern facilities can only improve the performance of the team and the experience for the fans. Of course, the only way that this should happen is if the organization takes it seriously. No mere cookie cutter stadium should or could ever replace Wrigley Field. The design would have to incorporate some of Wrigley's iconic features, such as the bricks, ivy, scoreboard, and red marquee in a way that is a tribute without being a direct imitation or appearing garish. Any new ballpark should be a reflection of the past, with an eye for the present and future. 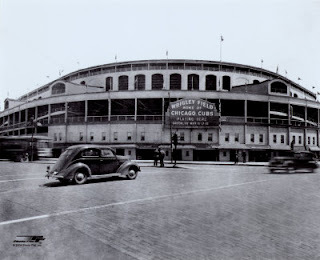 Said ballpark should rival the scope and tradition of our venerable old ballpark while providing modern facilities for the players and fans of today. And by that, I don't mean iPod docks, laptops in the lockers or a Jumbotron and canned music, but modern equipment and training facilities, things that Wrigley sorely lacks. For the fans, better bathrooms and the elimination of the possibility of being brained with a piece of falling debris, along with a concourse that provides heart-stirring views of the field, no matter where you are. Time marches on, the years slide by and while other teams have changed ballparks several times over, Wrigley has remained. She is a jewel, albeit somewhat of a flawed stone now. Let her go gracefully into the shadows of the past and let the Cubs build a new glittering diamond worthy and reflective of the new century while maintaining a bridge to the franchise's past. Ideally, the new owners could start now, with the hope of completing construction in 2015. As was the case with Yankee Stadium, let the All-Star Game be played one final time at Wrigley Field in 2014, her 100th anniversary, and send the lady out in style. I think any true fan of this team will still continue to support it, regardless of where the team plays. It's time to not just honor traditions of the past, but to create new ones.